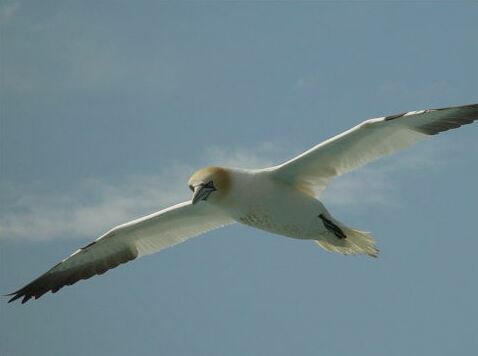 The Northern Gannet, is a large marine bird that can reach 102 cm in length. It lives along saltwater coastlines and does not go far from the sea. The bird is white, except for the black about its eyes and on its wing-tips, and the light yellow on its head and throat. The iris is pale grey. Males and females are identical, the young differing only in their brownish-grey splotches. With its long bill and pointed tail, the bird's silhouette is distinctly pointed at both ends. Because of its shape, it can reach 100 km/h during a 30 m plunge. It plunges deep below the waves in a vertical dive, and catches fish on the way back up. Size: length: 31"; wingspan: 70"
Male & Female: Similar. White head, body, tail, and inner wings; yellowish wash on head; black outer wing; large, gray, pointed bill; gray legs and feet. Takes 4 years to reach adult plumage. Breeding: Birds do not breed until they are fully mature at 5 years of age. Nest: A shallow nest of dried seaweed high on a precipitous cliff or along the top of a bluff. Nests in colonies, with nests close together. Incubation: Both parents incubate the egg using their feet as they do not have a brood pouch like Penguins. Both parents feed the chick regurgitated fish with the chick pecking on the parent's bill and sticking its head down the parent's gullet. The female lays a single egg each year and shares the incubation with her partner for about 43 days. In Flight: Flight is steady wing flapping alternating with glides. Voice: Guttural croak or grunt, heard only on breeding islands. Habitat: Open seas...nests on northern rocky sea cliffs.